One summer morning in 2015, Bruce Trulson, D.D.S., tilted his head back as he was shaving and noticed his right lymph node was swollen. He had a cold, so he didn’t think much of it. But a month later, when he realized the swelling was still there, he went straight to his primary care doctor at the Mayo Clinic in Rochester, Minnesota. As a dentist with almost 40 years of experience, Trulson performs oral cancer checks on every adult patient and he understands well the importance of following up on possible symptoms. And his instinct to get checked proved wise: Trulson’s doctor referred him to an ear, nose, and throat doctor (ENT) who gave him the news he says hit him “like a 2-by-4”: He had throat cancer. 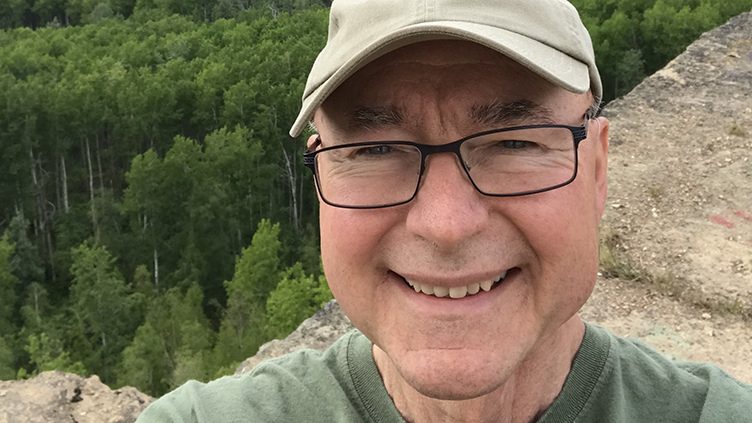 Three years later, after a successful treatment in a clinical trial at the Mayo Clinic, Trulson speaks with HealthCentral about his journey, how he has become extra thorough when screening his own patients, and the camaraderie he has found with others who have had cancer. HealthCentral (HC): What was your reaction to your throat cancer diagnosis? Bruce Trulson: I kind of expected the ENT to say, “Take this special antibiotic and go home.” I had patients scheduled for that afternoon and the rest of the week. Instead, he said they had determined that I had cancer, and he asked if my wife was with me. I called her and she came over and [they] explained the treatment options. It was a Tuesday, and they said they could get me in that Friday for surgery. My thought was, this is something I want to address ASAP. Let’s do it. HC: What were the advantages of taking part in a clinical trial for throat cancer treatment? Trulson: They told me I fit the profile for a study at the Mayo Clinic that was testing different treatment protocols for this particular type of neck cancer [caused by human papillomavirus (HPV)]. I had the option of traditional treatment or the new study treatment, and I opted to go in with the study because they were expecting to find fewer [long-term] side effects with the new treatment protocol. The surgery was basically three surgeries: They took out 30 lymph nodes from the right side of my throat and another 30 on the left. They used a [minimally invasive] robot to go down through my throat to get the primary lesion at the base of my tongue. After the surgery, I recovered for a month. Then, instead of the traditional 30 sessions of radiation over six weeks, I went in twice a day for 10 days. And I had a session of chemo on each of the Mondays between the morning and afternoon session. Those were pretty tough days. Overall, it was less chemo and less radiation, but in a more concentrated period. They’re in the process of doing a randomized study, but the latest I’ve talked to my doctors, it looks as though [this new approach is] probably going to become the gold standard. HC: What has your experience been with treatment side effects? Trulson: They told me what my [short-term] side effects would be, and they were right on. As for long-term side effects, I’m at less risk of osteonecrosis than I would be with the traditional treatment. And with the traditional treatment, there is a higher incidence of total loss of salivary flow [in some cases, resulting in long-term feeding tubes]. Also, the taste of things changed dramatically, but it’s slowly improving. There are just a very few things that don’t taste quite normal. I love ice cream, but that is, for some reason, one of the few foods that still doesn’t taste right. It tastes kind of like ice cream that gets too old in a cardboard carton. My neck is still numb — like if [I had] a tooth worked on. But it’s slowly improving; nerve regeneration is a slow process. The one thing for me is the dry mouth. And being a dentist, I know that gives you a much higher instance of tooth decay and gum disease. I’ve always been quite thorough about teeth cleaning, but now I have a new level of personal care. HC: How has your cancer experience changed your practice of dentistry? Trulson: I’m much more aware and sensitive to my patients who have dry mouth. Over the years, I’ve recommended different things to patients who have dry mouth due to medication or treatments like mine. Now that I’m using the same products, I’m finding [that a lot of them] don’t work that well. I’ve had to search out products that work for me, so I have more confidence in what I’m recommending. So, on the one hand, I have to deal with it for the rest of my life. On the other hand, I’m also able to give my patients better recommendations. Also, I check my patients much more thoroughly [for signs of cancer] and with more focus. If I have a patient with swollen lymph nodes, we talk about it, I ask how long they’ve had it, and I’ll often have them come back in a couple of weeks, and if it’s still there, send them up to a specialist. The other thing that I’ve noticed is, it’s like you’re in an exclusive club as a cancer survivor. Someone who has had or has cancer is more open to discussing it with me because I’m a survivor. Trulson: I’ve had discussions with a number of people who have had friends or family members who have had swollen lymph nodes and ignored it, including a friend whose wife had swollen lymph nodes and put off getting it checked. By the time she went in, the cancer had spread throughout her body, and she passed away. Whether it’s your neck or anywhere, changes mean your body is talking to you: You should listen and see a specialist. Hopefully it’s nothing, but the earlier any kind of cancer is caught, the higher the survival rate. 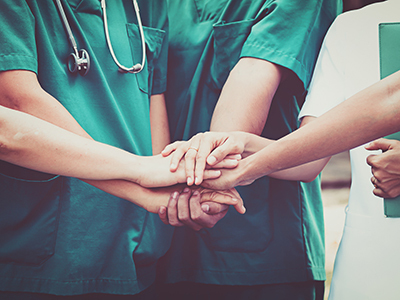 If you have head and neck cancer, you'll need a whole team treating your condition. Here’s who you might encounter on your cancer journey.